The Friend Ship Is Here! A multi-genre voyage toward social communication and emotional awareness. I want to listen to a few songs! What’s the Friend Ship all about? For kids ages two to five, the seas of life can be rough. They’re expected to be a social person, but they don't have things figured out yet. 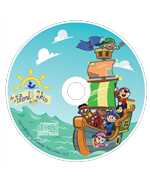 The Friend Ship is an album full of songs designed by a speech therapist to help kids, parents and teachers rock out and stay on course. Really enjoyed presenting about supporting caregivers to teach social communication at this years California Speech/Language and Hearing Association! One year after it's release, the Friend Ship for Kids is doing well! Check out reviews here. Need some pointers to help navigate the songs? Optimize your experience with the Activity Booklet! 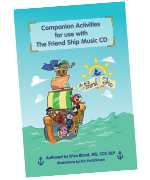 The activity booklet comes with a collection of activities and suggestions for parents and professionals that can be utilized in order to carry over the concepts of each song on The Friend Ship CD. Of course the CD is great on it's own, but even better with the booklet!